The era of former president Gen (retd) Pervez Musharraf will always be remembered as an era of economical development. Although having a military background, he proved himself to be a man with a vision to take the nation ahead instead of being a war monger. During his tenure the infrastructure of Pakistan increasingly developed. He strategically saved the nation from the fallout of 9/11 incident, he never compromised on the nuclear program when there was immense pressure on Pakistan to roll it back. Critics say that he was obedient to US but intellectuals say he was after all not playing in to the hands of US but was strategically protecting the nation in a clever way. Gen. Musharraf in the office. 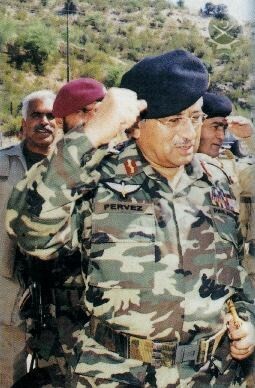 Under the leadership of President Gen. Musharraf, the democratically elected and newly formed political party PML (Q) made progress in the economy which grew by 100 % and the vision and policies helped Pakistan come out of the list of Highly Indebted Poor Countries (HIPC) resulting in the outcome of increased growth, economic reforms and path of prosperity. The world financial institutions like World Bank, IMF and ADB praised Pakistan for its reforms and economic achievements. The rate of Dollar was steady at 60-62 rupees throughout the tenure. The massive scale of development led Pakistan into the list of N11 countries with a rising economy at 7.6% per anum which was second to China. The mega projects of Gwadar sea port and motorways are an extraordinary example. There was a tremendous reduction in poverty level during the period of 2000 - 2007 which dropped from 34% to 24% due to which the overall living standard of people improved dramatically, his contributions to the improvement of Pakistan's economy were commendable. With the troops at the frontline during the 2002 standoff with India. The death of Baloch leader Nawab Akbar Bugti in 2006, sacking of Chief Justice of Pakistan Iftikhar Muhammad Chaudhry, operation against Lal Masjid and assassination of Benazir Bhutto in 2007 were the issues which were exploited and over exaggerated by the media against Gen Musharraf to force him out of power. At the Polo festival in the northern areas. In August 2008, the rival parties, Pakistan Peoples Party and the Pakistan Muslim League (N) united themselves to impeach Musharraf and force him to step down. Every human makes mistakes and Gen Musharraf admitted making some mistakes in his last speech but his loyalty to the country was exemplary. Finally the nine year long period of Gen Musharraf came to an end and on 18 August 2008 he resigned from his post and received a guard of honor.